New Pool is one of our best high water pools and fishes well in all higher levels. This pool holds the record for the second largest fish caught at NFC as well as much more great fish. For New Pool the water level cannot be high enough, even in a flood, it is most likely fishable and one of the first pools which begins to fish well again after a flood. The pool in higher water is a long stretch, but you never need to fish very deep here. This is because the current is rather slow, and the pool is not so deep – but it still holds many good fish! New Pool is one of the pools where fresh running fish usually stop to rest, at least for a while, so there is a good chance to hook them. New Pool was in the past always a big fish pool, and in this pool, there is not much danger of losing the fish on rocks, so if you hook a big one where there’s a great chance to land the fish! Matthew Solon with a 6 kilo fish in Beat A1. This pool fishes best in high water, from water levels above 120m³, and continues to fish well in water levels all the way up to and above 350m³! 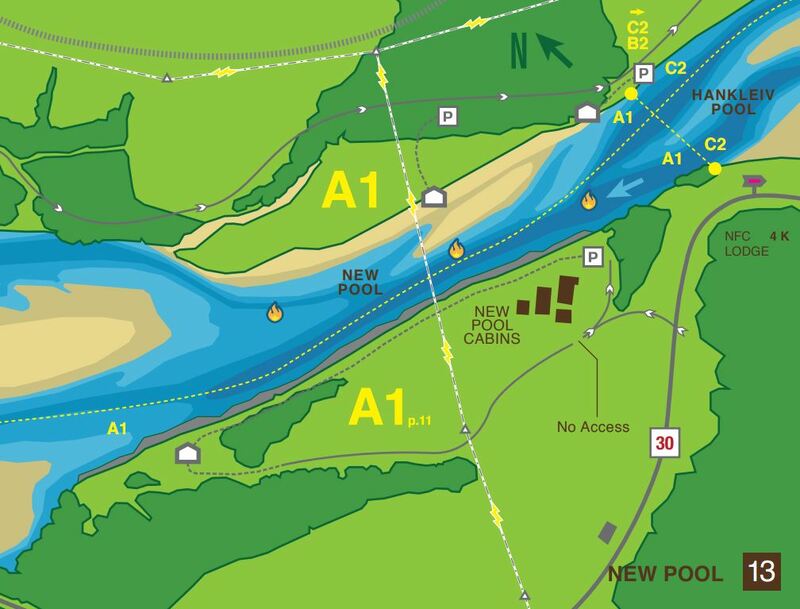 In high water, you start fishing New Pool (from the right bank) from the neck of the pool, just above where the cabins are on the opposite bank with light to medium sinking lines. In high water levels, you can fish the whole way down to where the river divides into two channels. From there, the water gets too fast to wade and fish the pool from the right bank stops there. 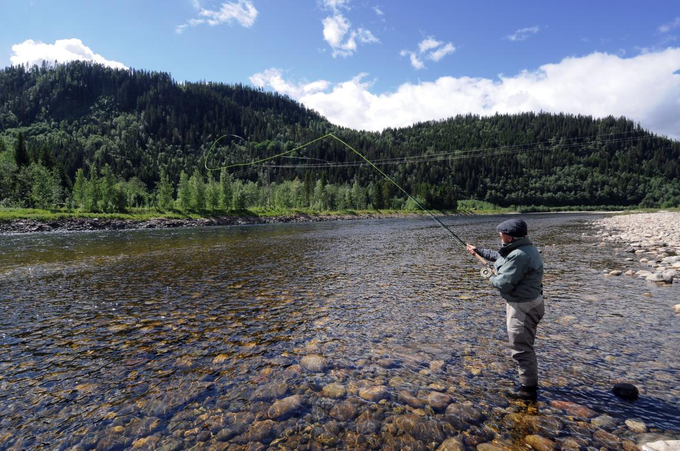 This pool used to be a classic early season and high-water spot, so big tube flies are usually the right choice, but as the level drops, and the current slows down, flies do not need to be huge. As always, try to fish through the pool several times, rather quickly, and with different depths of lines and various flies. A good taking spot is at the powerlines- starting at the few solitary trees just upstream of the powerlines, to well below the lines. This is the area where most fish have been hooked in the last years, but when fish are running takes can come throughout the pool. Fishing from the left bank we only recommend in the top part in high water conditions, as the remainder of the left bank is too fast in high water- if you try it, use heavier sinking lines. New pool continues to fish well in medium water. The best area is from the top of the gravel bank (right bank) down to the powerlines and continuing below the middle part where the side channel starts to slow down. Fish this part quickly with a stripped fly in case the current becomes too slow. Looking from the left bank, the left channel in the lower part of the river fishes well and it is worth a try, but here you need to be careful with splashing lines, otherwise you will spook the fish. In medium levels one should use mostly floating lines, possibly with sink tips or with an intermediate line. Full sinking lines are too heavy for this beat in these water levels. 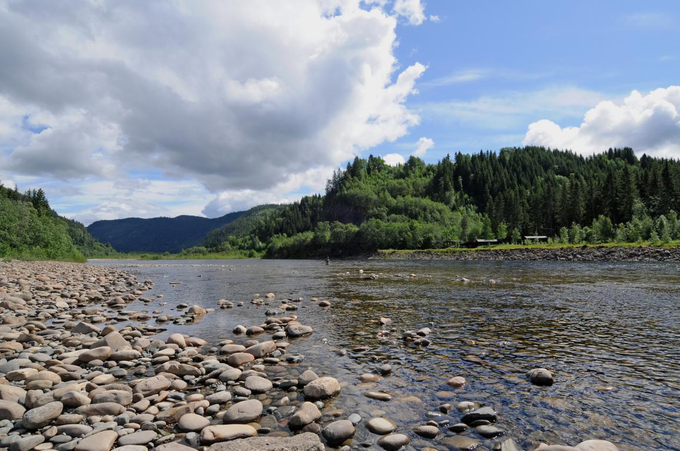 In low water, concentrate your fishing in the upper part – from the neck of the pool, to the powerlines, as well as in the very lower part- well below the side channel (in low water the side channel will be dried up). While the belly of the pool just below the powerlines might be too slow, it is always worth trying with a stripped fly. We recommend fishing here in the low light of the day- either at sunrise, or once the sun has set. The last hours of the day, the night (July), or the early mornings are the best option in lower water. 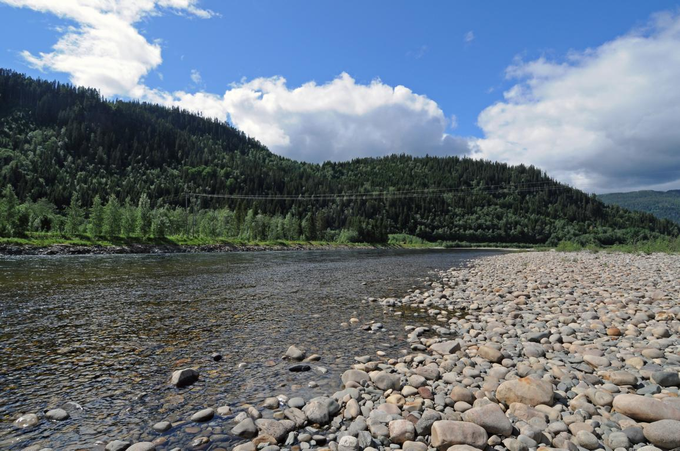 In these conditions, a floating line is the best choice to avoid spooking any wary fish. Fishing from the left bank may be better in low conditions, especially the middle and lower parts, but if you decide to fish from the left bank you have to move as silently as possible and be careful as wading the rocky bank can be tricky- especially at low light. 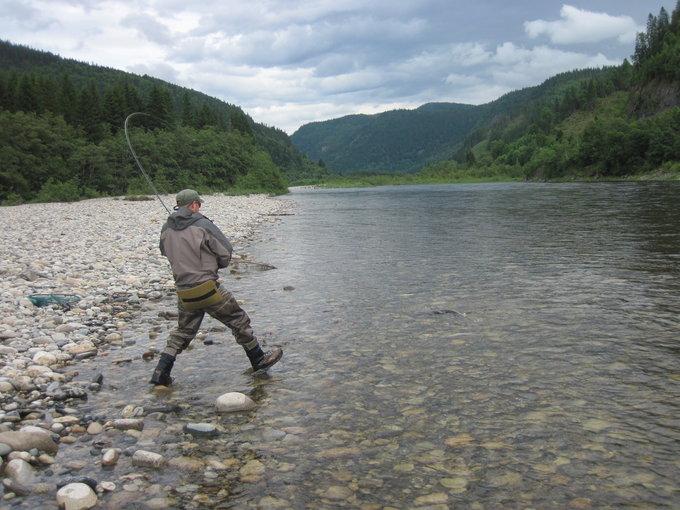 With the ever-changing conditions of the river, it is worth giving it a try.